Missing more than hitting in your E-mail marketing campaign? Don’t give up on it just yet. First of all, before you continue reading, you may want to check out our previous post on how to start an E-mail campaign. We hope you’ll enjoy applying the great tips we’ve listed in there. After the tips come the tools. We’ll let you in on a little secret: here at Lakeshore Branding we use something called MailChimp. So MailChimp is basically this cool new E-mail marketing service that’s simple and easy to use. It’s fairly new, but the service has grown to have more than 400,000 users (including us!) and 20 million emails served daily. If you’ve never launched a marketing campaign through E-mail before, then you might want to consider using MailChimp to make the whole process easier for you. Yeah, sure, the name sounds kind of quirky, but don’t be deceived: MailChimp has a powerful, developer-friendly product that definitely makes E-mail marketing more fun and, potentially, more profitable. So MailChimp has four basic templates for you to start with. Basic, yes, but also highly-customizable, and flexible enough to let you add images, headers, color schemes, design elements, and integrated apps. In fact, we’ll go so far as to say that among all the E-mail marketing tools that we’ve tried, MailChimp is the simplest, but also the most flexible. There’s a WYSIWYG editor that allows you to point and click, drag and drop, and customize to your heart’s content. A recently added online interface, meanwhile, lets you walk through all kinds of images and headers for your newsletter template – just in case you’re having trouble finding design inspiration. MailChimp also has predesigned templates for your E-mail marketing campaign, although you can still design and make your own, too. This includes the ability to change your E-mail alias and add tags for added personalization. The MailChimp service also includes free, unlimited image hosting. If you don’t want your E-mail subscribers to see the MailChimp logo, you have the option to remove it, but choosing to keep it actually entitles you to free incentives, affiliate rewards, and credits that you can apply to your monthly fee. What makes MailChimp a Lakeshore Branding favorite is that it’s so developer-friendly. There’s an open and free MailChimp API that makes it easy to connect your website to its platform, and to integrate the E-mail marketing tool with your other favorite apps, plug-ins, and systems. If you’re an online retailer, for example, MailChimp fits in perfectly with e-Commerce systems like Magento, Shopify, PrestaShop, and Zendesk. That way you can start tracking orders by the E-mail campaigns you launch. Are you a prolific blogger? Then use MailChimp’s WordPress and TypePad plug-ins to sync “active subscription” data into MailChimp, so that only up-to-date accounts receive E-mails. Thanks to this API, you can also pass purchase history data into MailChimp, create list segments, and send even more targeted campaigns. Social sharing through the MailChimp platform is also pretty easy to set up. The latest version has advanced social media integration tools that allow you to launch and share your E-mail campaign across your social network – Twitter, Facebook, Digg, LinkedIn – while encouraging your recipients to do the same. MailChimp is also ready for mobile; all users have access to their own accounts via their iPhones, Androids, and other smartphones, or through the MailChimp iPhone app. After customizing your E-mail templates and adding your favorite apps, the next step is managing your contacts and subscriber list. That can be a pain, right? Well – MailChimp makes contact management smooth and easy, too, giving you the option to import contacts from Excel, CSV, Txt, Salesforce.com, and Highrise. MailChimp lets you send E-mails right away or schedule them according to your campaign strategy. According to the company, the deliverability rate of sent E-mails is 100 percent to all major E-mail servers. Meanwhile, bounced E-mails are deleted from your contact list automatically. From the tests we’ve run, there’s little lag time between sending and receiving – another excellent reason to use MailChimp. MailChimp provides standard reports for tracking click-throughs, sent E-mails, bounces, etc – reports which can then be exported as Excel or CSV files. But what we’ve done here at Lakeshore Branding is integrate it with Google Analytics, so that we’re able to access other kinds of data as well, like social stats, international data, time to response, and other important information that can prove crucial to your E-mail marketing campaign. Another exceptional MailChimp feature is A/B testing. Usually you’d have to set up another system to do that, but MailChimp already integrates that into the application, so it’s much easier to make significant improvements to your E-mail marketing campaign. 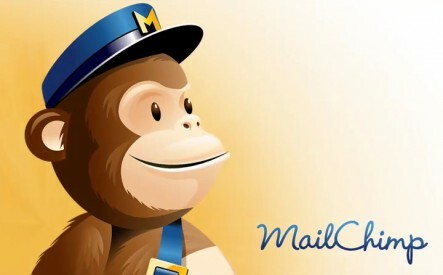 Mailchimp is totally free for lists below 500 subscribers, so give it a try. If you want to sign up for a premium account, you can pay as you go: fee is based on either the number of contacts that you add or on the number of E-mails you send monthly.